is correct in its emphasis on the word "blindly"... don't blindly do anything. But Elizabeth Chamberlin also provides evidence that you shouldn't blindly trust EU Law, or Greenpeace and E-Stewards, either. 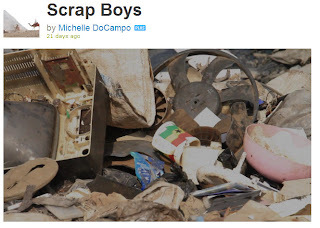 Chamberlin trusts her eyes and is doing what she should be doing - looking at all sides of the ewaste-to-Africa debate. Now I'm gonna go Ozark Atticus Finch on her. Where is Greenpeace's interview of the accused? They have the African Tech there on camera, and say he told them it was not a working TV but they bought it anyway. What exactly does their methodology prove, and why didn't they ask the African they spoke to what the percentage of reuse was, and what his losses were on the bad units? What's Your Worst Ebay Feedback Ever? We are the 99%. That is, the 99% Positive Feedback on Ebay. Good Point Recycling / American Retroworks Inc. was a pioneer on ebay. I sold a lot of sewing machines "as is for repair" back in 2001, and got our first "delighted!" feedback from a sewing machine conaiseuse who was looking for several of these and found them good homes and loved that we had scavenged them from the scrap metal bin for reuse. Later I learned that certain very long monitor cords and cables were hard-to-find, and selling the longest ones out of the scrap copper proved appreciated by ebay buyers worldwide. But you can't please all the people all the time. From time to time we are with 100% positive feedback, but eventually someone doesn't like something in the used, as-is, for-repair market. Even full refund policies are no guarantee to please the most picky ebay bidders. This year, my favorite bad feedback was for a sale of scrap gold to an international bidder in Eastern Europe. The negative feedback arrived in Spanish (?). Evidently, the delay from shipping time caused the scrap value to decline on world gold markets. Since the value of the gold scrap was worth less on the day they got it in Eastern Europe than it was on the day they bid, they wanted a full refund. Without returning the gold. Hmmmmmm. Refund? Or live without 100% feedback? Thanks to Waste and Recycling News for adding a 5th film to the list of "E-Waste Samaritans" this week. The teaser video on Vimeo for the documentary "Zabaleen" rounds out a busy week for investigation of the crime of the decade - Recycling While Brown. 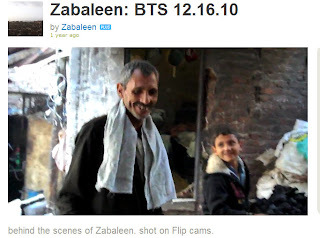 In Zabaleen, director Justin Kramer digs into the social, political and economic divide inside Egypt's own have-and-have-not society. Campanelli keeps it simple and not political. Appreciate garbage people and recyclers. They could be heroes. While the editorial maintains WRN as an apolitical, unbiased interviewer, Campanelli gets makes the Brown Recyclers' story to be an environmentalists story, an underdog's story, a refreshing change from the "primitive toxic" story. ""The general view is that these people are what they handle," said Kramer. "Most people, especially younger people, look at them as just disgusting. They don´t see the good that they are doing." The good is an astonishing diversion rate. The Zabaleen are able to recycle or reuse 80% of what they collect. The organic waste becomes feed for their livestock. The paper, plastic and metal go to recyclers. "The sustainability of these people is completely off the charts," said Kramer. "They don´t waste anything." The citizens of Cairo didn´t realize the service these people provided until 2009, when, in the wake of a swine flu scare, the government ordered the slaughter of all the Zabaleen´s pigs – hundreds of thousands of animals. First things first. Let me welcome Elizabeth Chamberlin of IFIXIT.org, a new blogger using Kyle's photos to tell the other side of the story. She came charging out of the gate last week. Hope she puts me out of business. Second, for a wider audience, ALJAZEERA is back on the job, and getting closer. 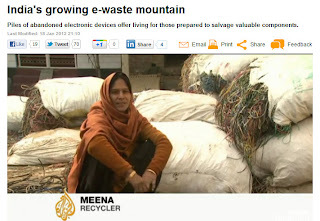 Reporter Sohail Rahman is NOT reporting a "feel-good story" on e-waste in Al-Jazeera, but it's fair. He documents both good (recycling and reuse rates), bad (aqua regia and toxic recycling processes) and ugly (women doing hard recycling work without toxics, but without sophisticated tools either). Obviously a "ban on exports" will do nothing for Mowgli's Sister Meena (interviewed in the film). Almost as obviously, the recycling shown kicks the bejeezus out of Mining and Smelting and Disposal as an environmental process. What bugs us are images of poverty. Most Americans want to vote whatever takes the photos off the screen. Banning trade with these people, however, is just turning our heads, it does nothing to help. She says in the interview that the boss gets the money and decides what to pay her. What we want to do is give the boss even nicer material, with more repair value, from richer neighborhoods - in return for sharing the proceeds fairly with Meena. That, says BAN.org, makes me an "apologist" and makes Meena "a polluter". This film shows a lot of what I saw nine and a half years ago when I visited Guangzhou. Except its missing the also really cool and great stories of Techs of Color fixing and reusing and Tinkering, riffing like guitarists, whipping new uses out of old chips and display units, turning yesterday's CRT monitor into tomorrow's TV-Video-Monitor combo with all-bandwidth tuner technology. In January 2002, I drove this rusty blue used Penske truck through the snow, across Applachia, from Memphis to Middlebury. I always remember seeing myself in the mirror the morning after I signed the papers, a chill feeling of ice water in my abdomen. On the road that night, I had hours to think about what I'd just done with my home equity, my wife and two young twins in the small car trained in my headlights ahead of me. 1. We have good ideas. 3. We tell the truth every day. Among Green Entrepreneurs, "good ideas" are plentiful. 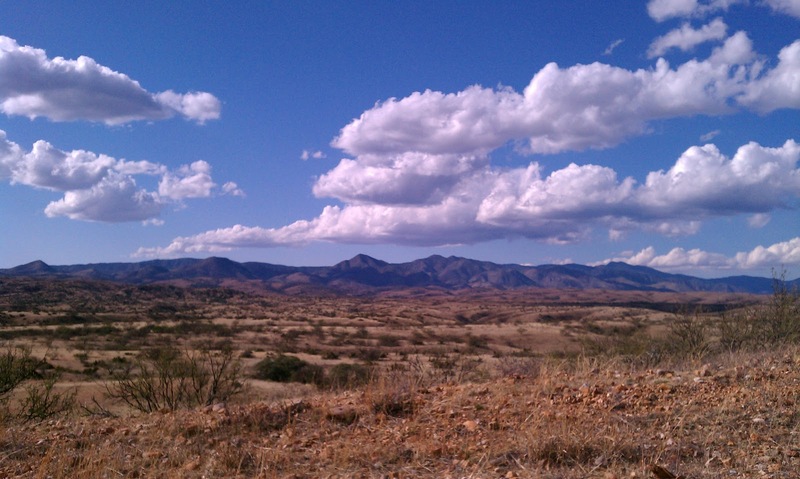 Successful, sustainable, self-sufficient environmental programs are one in a dozen. Recycling passes the tests so well, it has become taken for granted, like laundromats and gas stations. Few remember the challenges of setting up the recycling infrastructure, the net to capture subsidized extraction and keep it in the loop of consumption. I've tried doing this as a protester in my twenties, as a regulator in my 30s. For the past ten years, I've been putting my own silver, sweat, blood and tears into this, and its time to assess. I was not by myself on the front lines, in the foxhole, but I was in a place somewhat unique among advocates, lobbyists, regulators, policymakers, and corporations. 3 Recycling Films: "Where" is E-waste Exploitation? TV at dump in Ghana. Imported.. but when? I'm postponing a post I'm writing about my ten year anniversary at Good Point (in January 2002 I bought my first asset, a used truck), to say a bit more about the Scrap Boys Ghana Agbogbloshie film reposted yesterday. 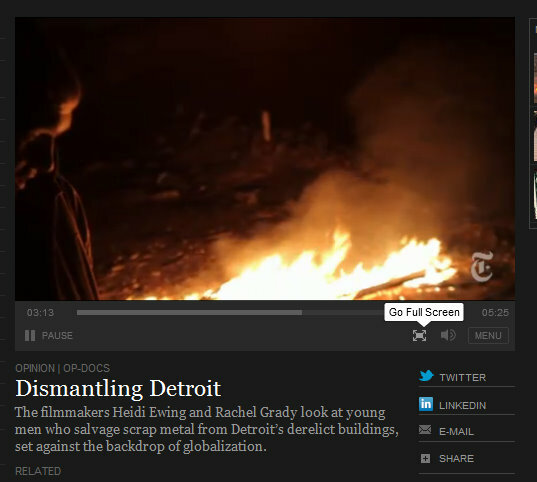 Dr. Josh Lepawsky of Memorial University in Newfoundland sent me this link to film of recycling in Detroit. It appears in NY Times as a short, "Dismantling Detroit", and the young men interviewed serve as kind of a comparison to the "Scrap Boys" in Agbogbloshie. Josh and his grad student Chris McNabb came down to visit our "fair trade recycling" pilot recycling plant in Mexico two weeks ago (Third Video: PBS on Las Chicas Bravas at Retroworks de Mexico). Josh has written about the theory he's studying, The Pollution Haven Hypothesis, which is that avoided disposal costs explain geographic displacement of PCs. The cost of disposing the junk (or surplus) product here in the OECD represents a value that could partially offset the cost of geographic displacement. The environmental and social benefit of OECD's higher standards may be assumed lost, or be a cost to the recipient. But what was good about the item, which caused African entrepreneurs to pay for its relocation? Is this also about externalizing value, or only costs? What's the cost (or value) of properly recycling it in the new location? What's the retained value after pollution haven is debited... i.e. what is the raw material and reuse haven value? The "value" of a labor hour in Ghana - about $1.68 - alone creates an economic disincentive to do the work for USA minimum wage. But accounting for all the "unfair" and "pollution haven" values, are we left with a symptom or a cause? What is the value added? Where's the baby, and who is holding the bathwater? Below I make my case for the "Reuse Haven" hypothesis. Both depressing films focus on symptoms. If we stop world trade, will we make the symptoms go away? What other effects would that cause? Can the third film - on Retroworks de Mexico - offer a compromise? A film by Taylor Patrick, Michelle DoCampo, Mary Ellen Skawinski, available on Vimeo. There are a lot of good film clips in this. And I'm sure Michelle, Taylor, and Mary Ellen meant well. Now ask how many of the latter jobs your student can achieve without access to a used computer. The answer is NONE. Not one of my students could afford a new computer, and none of those jobs are available if you can't get internet in Africa. After watching the film with the sound off first... play the sound during the interviews of the actual African scrap recyclers. These are interesting. Then watch the whole thing. This is a lot like the Fair Trade Cotton attack (Bloomberg News V. Victoria's Secret) last month. "It's as if recoiling from images of poverty is becoming equated with compassion." After I watched the Scrap Boys video the first time, I watched again, and I followed scene-by-scene by annotating. You can read what's happening with the sound off, below. By the way, there's lots of talk about "e-waste", but practically no "e-waste" of any kind visible in the film, or at least not in "imported quantities", and certainly nothing like nice equipment being unloaded from containers in the Greenpeace video. "Europe just says out loud what most people are thinking"
This is based on an expression we have been hearing from the "far right" in Europe for a couple of decades. Europe has a "special relationship" with Africa. They tend to think of themselves as more enlightened, having avoided a century of slave plantations. But there is a conservative undercurrent. The "enlightened" and "fascist" lines have been drawn, and everyone assumes they know which side they are on. So is it possible that Liberal Europe has defamed Geeks of Color in a widespread "profiling" campaign about "ewaste"? Surely not. Not socially conscious, liberal, environmentally sensitive, precautionary Europe. But what Europe is also lacking is a century of integration following the abolition of slave plantations. The French were very relieved to have African American writer James Baldwin hanging out in Paris for the last decades of his life, talking about how much freer he was than in Harlem. But he wasn't around much during the organizations of marches by Martin Luther King, and was pessimistic about whether America would ever pull off the integration. The French have basked in the reassurances of Baldwin until "The Fire Next Time" broke out in the riots in streets of Paris in 2005. There was speculation whether a conservative backlash would - or did - occur in the electorate. Sarkozy was elected, Jean Marie Le Pen's party did not however get power. My point - and it is a very delicate one - is that Europe has a little bit of a history of kicking the can down the road when it comes to integration, and of coming up with social theories without the benefit of a lot of discussion with the minorities closely involved. I'm pointedly concerned about the latent "assumptions" of primitive behavior in the USA environmental movement, something I first addressed in "E-Waste Soccer and The Accidental Racists" in November 2010. But I think Europe is worse, because they may assume "liberal" and "fascist" lines are all you need to know about trade, pollution, and exploitation. My point is delicate because I may be a world minority (most people in the world are browner and darker haired than I) but I'm not one in the USA and can't pretend to share the insights of James Baldwin or Dr. King or Malcom X. It's also delicate because I'm married to a liberal French Professor in the politically correct Peoples Republic of Vermont (French professor in both senses of the words). Europe's environmental community is susceptible to the assumption that environmentalists are racially hip and Jean Marie Le Pen is not. Europe does what some rural northern states in the USA are prone to do - cast the demons of racism into the redneck swine and assume they are above it. This leads the conservative anti-immigration segments in Europe to believe that "they are just saying out loud what everyone else is thinking but won't admit". What we call in the USA the "NPR Juan Williams" crime. Short important lesson on starting your own recycling company. We have 36 employees. We started with one truck driver / CEO / Accountant (me). At the beginning, 0% of our workforce was on drugs. Then, along the way, we rode through a period when the Vermont unemployment rate was below 4%, and we were still growing and not a high-paying company. A certain number of unemployed people are toxic. Sorry, that's not heartless. It's just a given. Drug users tend to get fired and come looking for work elsewhere. If you are soft and "close one eye", they will wind up destroying your company and taking the other eight or ten jobs with them. We are now at the point where we have "grown ups" in every department, people who don't have a monkey on their backs and who care about riff-raff getting into the place. Recycling and scrap businesses are still seen as a low barrier to entry, and we have to be wary. 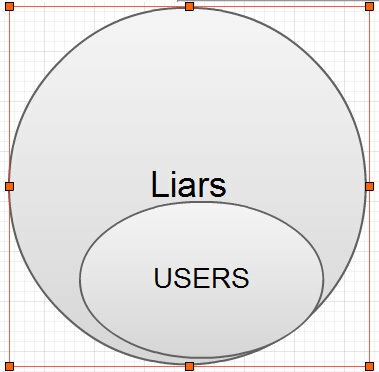 But it all boils down to this: Not all liars are users, but virtually all users are liars. The more you become good at lying, the more pathological you become at it. I tried to stay friends with the drug crowd who were my friends after high school. But the temperature of the lying was rising. "Avoided disposal costs" economics, which I helped pioneer in the 1970s and 1980s, has turned "toxic". Normally, economically developed economies throw out more and more waste (garbage) as consumers gain confidence, buy new, and discard things of marginal value which take effort to maintain. When your neighborhood is wealthy, no one wants your "free" black and white television, and it goes into an attic or basement or garage. As my generation became aware of population growth, finite resources, and habitat consumption, we were alarmed. We wanted to save trees, to avoid mining, to save endangered species, preserve habitat, and conserve energy and carbon. Recycling was a concrete, conservative, karma yoga way to do all of those things. It seemed risky to say I'd get a job "recycling". At the time, Recycling was akin to dishwashing. I didn't know anyone wealthy doing it (unless you counted the same mills switching to using virgin material according to price points). The economics of making more money collecting scrap were at odds with providing the scrap more cheaply, which is what the Big Picture wanted. Recycling needed to be plentiful and cheap to win over mill consumers, and not owning a mill, I was at the collection end of that equation. Departing Words CES Presentation - "EWaste Not"
My points on yesterday's panel at CES were that the Geeks of Color, and the buyers in the Emerging / Converging Markets who depend on them, are tomorrow's market. 70% of electronics sales in Africa are used, some of the 30% "new" are actually refurbished cores. When places like Egypt had a desire for big USA brand names (and aversion to E-Machines), the USA was like Ford Motors, watching new drivers get their licenses and learning to drive used cars. Ford needs used cars so that people learn to drive sooner and own more cars in their lifetimes. Similarly, our electronics industry needs the used equipment to give people an incentive to get online, watch programming, etc... which will lead to new markets and sales in the future. When Egypt or Indonesia bans imports of anything more than 3 years after date of manufacture, it's essentially a ban on all used sales. Goods are often not sold for a year, and then they are used for at least two years, then it takes months to collect and ship them. 3) Learn to like cheap no-name, white box, Chinese brands. Product Refurbishment and Reuse in the Developing World: What is its Current and Future Role in the CE Industry? In developing nations, refurbishment and reuse activities are a major part of local CE industries. How do refurbishment operations meet local consumer demand? How do they affect the environment? go-to locations for operations like warranty repair? Willie Cade – PC Rebuilders & Recyclers, LLC. Douglas Smith – Sony Electronics Inc. Wealth and population overlays with national boundaries.... The mega-city (combined borders) of Hong Kong, Guangzhou, and Shenzhen now hosts 120 million people! That's comparable to Japan! Every IPad, Android, Blackberry, and Kindle are manufactured there. And Guiyu is their scrap yard for Chinese-grown "e-waste". Now, as if comparing OECD Greece to non-OECD Singapore was not silly enough, look at the way cities fit in with the definitions of OECD and the Basel Convention. 83% of the world's population which lies in the "non-OECD"... Many are poor peasants in the countryside. But many others live in thriving urban environments. People in the west are equating "non-OECD" with "third world", and they are quite, quite different. The UN Report shows that cities are growing like crazy overseas, and they have billionaires and subways as well as their own dumps for their own upgraded "stuff". The OECD, in deciding how to admit new member "nations" onto the club, has to consider the entire country, no matter how crazy the Europeans were when they drew the lines on the map. Russia, a non-OECD member, has to answer for Siberia to get admitted. Recent new OECD members (suddenly ok to trade with, as of last year, according to HR2284) Israel, Estonia, Slovenia and Chile have smaller borders, so perhaps it was easier to admit them. Brazil will be a tough "country" to approve, even if Rio and San Paulo have converged into a booming mega-city. Penang and Borneo are both inside the national boundaries of Malaysia - as Singapore used to be... expect OECD to get around to them later. A lot of China may still be "third world-ish" for years, but look at the map of Chinese markets - cities which have converged to smart phone use on a par with USA and Europe. The distribution of goods, waste, and wealth within districts of those cities of the world accounts for MOST of the trade of e-waste between "rich" and "poor"... without export or import. The poor of Dharavi slum of Mumbai have virtually NO imports from the USA (India strictly filters and regulates scrap imports), but they have plenty of e-scrap. The growing wealth of Mumbai creates more than enough used electronics to keep the slumdog recyclers busy. 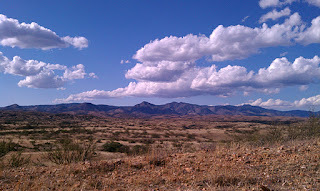 I'm stumbling around on my Phoenix-Tucson-Fronteras-Sierra Madres-Bisbee-Tucson-Phoenix-Las Vegas (CES) trip. Have had some time to get a few articles and insights into draft, but need time to get the right pictures etc. I think there is some really new insight into the USA's "E-Wasteland" policy to come out of this. I've got pictures of mining trucks the size of a three-story restaurant, hauling red rocks and mud from the pits of the earth. I've got pictures of grandmothers' fingers turning tiny screws to release optic sensors from CD roms, which we can sell to laser-pen manufacturers in China. Tomorrow I'll have pictures of the latest new gadgets from the Stuff-a-Plenty show (CES) in Vegas. I had 4 days of intensive conversations (as well as silly movie scene recollections) with Ph.ds and grad students, discussing Marxist vs. Smith labor economics. Along the way I've been meeting with Indie recyclers in the trenches, patching their minivans with duct tape, cruising the streets to take massive wooden projection console Televisions from the spare rooms of retirees, and providing phone support to staff in Middlebury. Now I have to spend all my remaining time putting together a Powerpoint for the CES Show in Las Vegas. I'll be with an august panel of experts and don't want to wing it. But here is a big insight on what people did that made a difference 50,000 years ago. That quote was one of my most powerful insights in 2011, crystalized after reading the December Bloomberg piece on fairtrade cotton and Victoria's Secret. It's a powerful human impulse to harness, and Bloomberg reporter Cam Newton (not the NFL player) is not the only "parasite of the poor". Another report came out yesterday from our friends at BAN, loaded with allegation, evidence, and a solution for your e-waste angst, dissonance, panic, unease, discomfort, and fear. The witch doctor in Seattle has a Copyrighted Logo cure for your toxic juju. It's the same parasitic business model, harnessing our cognitive risk, unease, and good intentions (or fear of blackmail via public watchdog "outing") without sharing a dime with the poor people used in the process. Read BAN.org's press release / email. Then look for evidence to support their allegation. But what most people don’t know is that most companies that call themselves electronics recyclers are not really recyclers at all. They are global e-waste dumpers. The vast majority of companies and organizations touting themselves as environmentally friendly “recyclers” are just selling this highly toxic scrap to brokers, who then ship to developing countries in African and Asia where all this waste is broken down in highly dangerous and destructive ways, creating what 60 Minutes calls “the most toxic places on earth” (seewww.ban.org/photogallery). Most people, Most recyclers, Most Toxic Place. Vast Majority... Hyperbole accusations are a bad sign. The NGO doesn't know what it is talking about, and is making "facts" up as it goes along. Providing false evidence is the first signal that someone is either mistaken or has an angle. I'm about to submerge into Mexico with some professors of history and geography. The best way to visit the "fair trade recycling" concept will be with history, geography, and economics. A lot has been written by OECD scholars about "converging markets" and "contract manufacturing". The question is whether hand- disassembly recycling, repair, and reuse is a decent way to achieve environmental benefit, amd whether it can create sustainable jobs in poorer countries? My theory, which I've approached from many angles in 2011, is that there has to be something good in trade for two parties to agree to it, and to do it over and over. If it's not all bad, then it needs to be reformed, not prohibited. Prohibitions and boycotts never work because they ignore supply/demand. The "attractiveness" of the export boycott is to Americans with typical weakness in geography, math, science and history. Ignorance lends us to bias. We draw conclusions from photos. We think that the entire south of Missouri is wiped off the map when we see homes destroyed by tornadoes in neighborhoods of Joplin. We think that "non-OECD", plus or minus six billion people, is "primitive". And if people invest capital around that misperception, they will tend to promote and market to it. The unholy grail is to get the processes of your competitors declared illegal. Selling CRTs to be rebuilt into TV/monitor combos? There may not be any pollution to it, but if I'm running my CRTs through a shredder I bought, it's ok by me for your process to be called "illegal". As Dilbert calls it, "Using the law to keep justice at bay." Whether patent law or environmental law or export law, if there are lawyers there are interested parties. A brief history of how government programs to collect deposit containers failed to keep up with the times, and what it means for e-waste and health care. I don't understand how people failed to grasp this when I was at Massachusetts DEP, and still don't seem to grasp it. The bottle bill was an anti-litter campaign before it was a recycling campaign. It somewhat arbitrarily went after "carbonated" beverages and not juice, and failed to anticipate bottled water. Most of the bottles and cans returned for deposit are single-serve. Most of those are consumed away from home, at the office or in the car. Most of those are collected by janitors, custodians, and pickers, and brought to redemption centers (not to retail stores). The redemption centers, in 1996, were 2% of the locations but handled 40+% of the total volume. They haven't had a handling fee increase since the 1980s and some of the distributors stopped collecting from them, making them drive out of state to deliver the containers for no additional fee. Janitors and park-pickers need the redemption centers. No one wants people with 600 cans and bottles inside the retail supermarkets. And curbside programs don't do office buildings and parks (though that could change with my Tomra recommendation below). Five Essential Characteristics of the Entrepreneural Mind. This morning, I thought about people who are really looking to get into the recycling business, people who are thinking of becoming entrepreneurs. For that audience, my own shanzai essay is a little one sided. There are of course other true entrepreneurs who have entered the "e-waste" business on completely different terms than I have. It takes creativity, suspicion, comfort with uncertainty, and experimentation to design an automated shredding and chopping and grinding machine, and to take a chance on not exporting when everyone else is donig so. I don't look down on any of the companies which established the USA's domestic recycling infrastructure. In fact, companies like mine NEED them to keep from sending toxics along for the ride, and for improving the junk in loads from 30% to 15% and better. I can't even blame those who helped to fund the insulting and racist campaign that turned my Egyptian friend Hamdy and his brother Essam, both with medical degrees, into "waste tourists" and criminals. Or at least, they were suspicious dark skinned exporters who no one felt comfortable trading with. And the other recyclers can't blame me for taking credit for my own risk. My ewaste company was on Hamdy's side when their friends twittered down the dictators regime. If some of the 30,000 computers I sold there since 2001 played a part, I'm glad. If some of those computers wind up in a Cairo dump 12 years later, with wire yokes scavenged by Zaballeen recyclers, the monitor would still have served its purpose 5 times as long as if it had been shredded after it was upgraded. And it will have helped 5 times as many people. And it did something besides play "Doom" or "Second Life". Heck, the computer itself lived a second life.